The high voltage switchgear market is directly linked to the transmission and distribution (T&D) network growth. 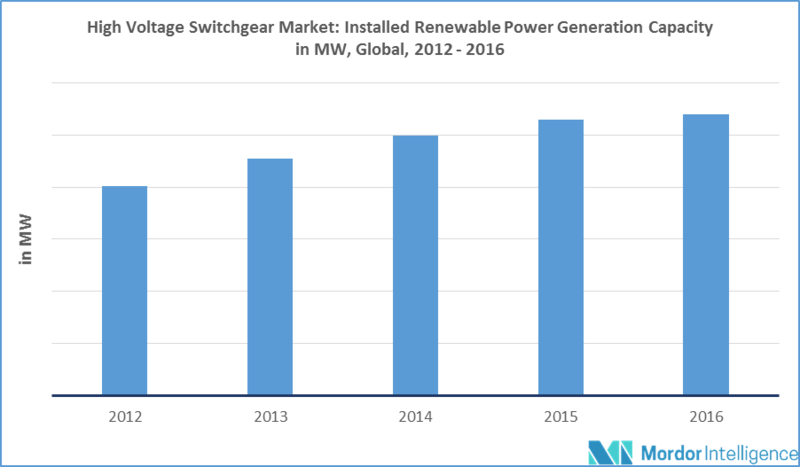 The growing electricity generation and consumption, along with the changing power generation industry dynamics, are expected to be the major drivers for transmission and distribution network growth, which, in turn, is expected to drive the high voltage switchgear market during the forecast period. The growth in developed countries is expected to be driven mainly by the transmission network renovation rather than expansion. The global electricity consumption is growing. Due to environmental concerns, many countries are reducing the use of hydrocarbons for electricity generation. In order to meet the energy demands, and reduce the hydrocarbon consumption in power sector, the focus on reducing the transmission and distribution losses has increased. The transmission losses account for more than 8% of electricity generation, globally. To reduce the per capita electricity consumption, countries are increasingly adopting smart grid technology. The smart grid technology and increasing focus on expansion and renovation of transmission and distribution network, are expected to drive the high voltage switchgear demand during the forecast period. In addition to this, the growing renewable energy sector has had a significant impact on the market. The renewable electricity is directly connected to national grids. The fluctuation involved in the renewable energy generation demands for a higher capacity, modern switchgear. Therefore, the growth of renewable energy is expected to drive the market demand during the forecast period. Electricity demand in the Asia-Pacific region is expected to experience the fastest growth during the forecast period. The power consumption growth in the region is expected to be driven by industrialization, population growth, and growing urbanization, particularly in emerging countries, such as India and China. Power generation dynamics in the region is also expected to witness a substantial change. The power generation sector in the region is dominated by hydrocarbon fuels. Due to the growing concerns over air pollution, the power generation in Asia-Pacific region is expected to shift from coal-fired and oil-fired power plants to gas-fired, and renewable energy power generation. In order to meet the growing power demands, and the changing power generation dynamics demands, the transmission and distribution network expansion is expected to register a significant growth, which, in turn, is expected to drive the high voltage switchgear market. Oil accounts for more than 40% of power generation in Saudi Arabia. The government of Saudi Arabia is further encouraging the use of renewable energy and gas to replace oil in power generation, as gas is more environment-friendly compared to liquid fossil fuel, and reducing the usage of oil allows the country to export more oil. The power generation in the region is also experiencing substantial growth. The power generation had registered a CAGR of 6.2% during 2006-2016. To meet the demands of growing power generation and rising share of renewables in power industry, the transmission and distribution market is expected to grow, which, in turn, is expected to drive the high voltage switchgear demand in Saudi Arabia. February 2018: VINCI Energies, through its subsidiary, Oxymon Energy Transition, won a contract from Société d'Electricité du Sénégal (SENELEC). The contract includes installation of ultra-high voltage transformer station, about 200 kms of overhead and underground EHV transmission lines and more than 100 distribution substations in Senegal. The total cost of the project is EURO 197 million and the duration of the project is about 36 months. MAJOR PLAYERS: ABB Group, Schneider Electric SE, General Electric, Powell Industries Inc., Toshiba International Corporation, Mitsubishi Electric, Siemens AG, Hyosung Power & Industrial System PG, Larsen & Toubro Limited, and Bharat Heavy Electricals Limited, among others.